Posted Monday, August 15th, 2011 by Robyn Warner. Most printers, whether they operate with toner, solid ink or ink cartridges, have a USB connection option. USB stands for Universal Serial Bus and is used to support connection, communication and power between a hub and external devices. This interface has become the most common on electronic equipment since its birth in 1994 when it was developed to make the process of connecting devices fundamentally simpler. Over the years, the standard USB has been revamped to match the increasing speed of computer hardware and the advancements in technology, such as mobile devices. Each upgrade represents a higher data transfer rate. If you print heavy volumes often and are looking for a new printer, you may want to be aware of the type of USB connection because it will alter the speed of productivity. USB 1.0– The original. This connection only allows a speed of 1.5 Mbps. USB 1.1– A slight upgrade from the original, clocking in at 12 Mbps and void of the issues reported with the 1.0. USB 2.0– The most common in current models and referred to as ‘high speed’. It has a speed of 480 Mbps, which is more than the rival FireWire 400 out of Apple, which has a speed of 400 Mbps. However, the FireWire 800 is said to operate at nearly twice the speed (800 Mps) of the USB 2.0. USB 3.0– This one is the newest, found only on the most recently produced printers. However, it was designed to be compatible with USB 2.0 ports. ‘Super speed’ of 5 Gbps, or 5,120 Mbps will keep pace with expanding hardware and technology. Start Menu> Control Panel> System> Hardware tab> Device Manager> Click the plus sign (+) in front of the USB controllers> If anything that is listed says ENHANCED, your USB is at least 2.0. 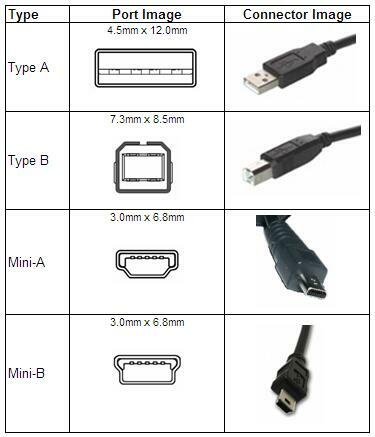 Type A is the most common, with a thin, rectangular shape that will connect to any computer or hub. Type B is used to connect to devices such as printers, scanners and external hard drives. Mini-A was once used for smaller devices, but is now obsolete. Mini-B is the new Mini-A and is used for devices such as tablets, cell phones, MP3 players and digital cameras. When you are purchasing a new printer, keep in mind that more connection options are out there, including ethernet for networking, PictBridge for direct connection to digital cameras, as well as, traditional wireless connection.